Dental implants are the gold standard for restorative care, allowing patients to regain the full function and aesthetic of their smile. Dr. Lan Dinh places and restores implants in our office, to provide patients with renewed bite performance combined with the durability and cosmetic appeal of natural-looking teeth. If you are missing one or more teeth and are looking for a prosthetic that is second only to natural teeth, contact our Corona implant dentist to schedule your exam and consultation today. Implants are the ideal dental prosthetic to restore jaw health and stability. Just as the roots of natural teeth, implants stimulate the structure of the jawbone when patients chew, preventing resorption and the sunken, aged appearance that results from tooth loss. This also ensures that regular functions of the jaw remain comfortable. At Eastvale Dental and Orthodontics we provide patients with implants made by Nobel Biocare, a trusted brand in prosthetics. Nobel’s implants have historically been made from high-quality materials, allowing them to integrate comfortably and effectively with the bone. These restorations ensure that our patients can enjoy the comfort of a stable and beautiful smile that lasts a lifetime. Our Corona dental implants are placed in-office, maximizing the efficiency of the procedure; patients are not forced to go through the lengthy referral process. For those who qualify, same day tooth extraction and implant placement are available, reducing the number of appointments required before your restoration can be placed. If patients do not possess the necessary bone density to support traditional implants, we offer mini implants. These posts require less bone than the traditional implants to effectively integrate and can be used for many patients with mild bone loss. We are also able to provide any necessary bone grafting to strengthen the bone before implant placement. For qualifying patients in need of full-mouth restoration, we offer the All-on-4®treatment concept. These bridges are supported by only four dental implants, which are shaped to allow patients with mild bone loss to receive implant-supported bridges. Dr. Linh provides this restoration in a single day, placing both the implants and the restoration. If you are missing one or more teeth and are interested in implant-supported restorations, contact our office. 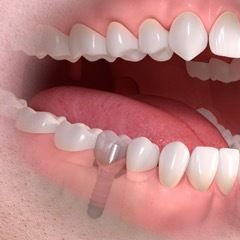 We provide patients with comprehensive dental implant services in Corona and throughout the neighboring communities.